The Japanese people call it karōshi: death due to overtime. Sometimes, peak suicide rates can be observed in connection with certain employers. Nine employees of the electronics company Foxxconn in China jumped to their death in only one year. Work and suicide can be related. The question remains: in what way? Researchers in Germany now have investigated for the first time the influence of working conditions on suicide risk. Statistician Jens Baumert from the Helmholtz Zentrum München headed the study. He has been researching factors that increase the suicide risk for many years. Previously, his work focus was on diseases such as diabetes mellitus and cardiac infarction. He broke new ground with his latest study: previous studies on the question whether work stress leads to suicide exist; however, their results widely differ. At least in Germany, no study has ever investigated the effect of certain working conditions. "The result surprised us", says Baumert. According to the Mortality Database of the World Health Organisation (WHO), some 9,900 men and women committed suicide in Germany in 2012. The WHO assumes a global rate of 804,000 cases. In its current report "Preventing suicide: A global imperative", the WHO conjectures that one suicide corresponds to 20 not documented attempts. The scientific world agrees that every suicide has more than one reason. In its report, the WHO writes, "There is no single explanation of why people die by suicide." Many factors known to increase the suicide risk are more related to people's private lives: increased alcohol consumption, smoking, living alone. People affected by one or more of these factors are considered at risk. Statistically, a single man of undistinguished education, who smokes, drinks a lot and is underweight, has a particularly high risk. The study of Jens Baumart and his colleagues now demonstrates that work-related factors can likewise increase the suicide risk. In addition to scientists from the Helmholtz Zentrum München, the study involved also scientists from the TU München's Klinikum rechts der Isar, the LVR-Klinik in Cologne and the University Düsseldorf. They drew from a long-term study. Between 1984 and 1995, employees in southern Germany were interviewed regarding their lifestyle habits, diseases and working conditions. The group is representative of the population. The team of researchers evaluated the data of about 6,800 people. 26 men and two women of that group committed suicide in the period after the survey period. Three categories were assessed: Firstly, the chronobiological and physically demanding working conditions were recorded. This includes overtime, shift work, noise and dangerous working conditions. Secondly, the survey enquired after psychological and social components such as fierce competition, high degree of responsibility and pressure to make quick decisions. Thirdly, the degree of work-related stress was recorded. The research team found that the suicide risk was significantly increased by bad chronobiological and physically demanding working conditions. Since mostly young men of undistinguished education are subjected to shift and night work, noise and physical demands, several risk factors can accumulate. Yet the suicide risk due to bad working conditions remained increased even independent of known risk factors such as living alone and high alcohol consumption. Employees subjected to a high degree of such unfavourable working conditions had a suicide risk that was more than twice that of employees working under less demanding conditions. Conversely, the scientists were unable to find links between suicide risk and work-related stress. 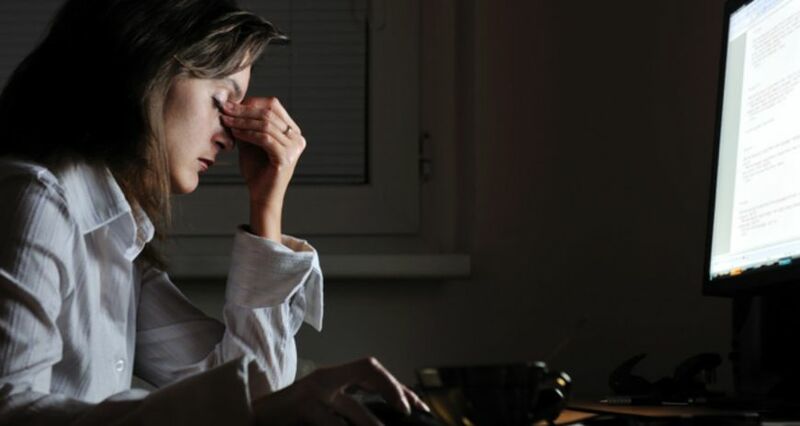 Although stress in the job can make people sick, it is more likely to result in chronic diseases such as cardiac diseases and diabetes and is less likely to lead to suicide. "Somebody experiencing strong levels of work-related stress is different to somebody being stupefied by permanent bad working conditions", Baumert explains the phenomenon. The suicide risk also remained largely unaffected by psychological and social factors. "That is a surprising result," says also Thomas Bronisch, for a long time senior physician at the hospital of the Max Planck Institute of Psychiatry in Munich, who has intensively studied the topic of suicide. "The study is beautifully planned because it covers a long time span and includes a large sample of people. It now remains to be seen whether other studies will provide the same result", he says. Of course, the study does not allow the conclusion that every night shift or assembly line worker is at high risk. "One single negative factor is likely to be compensated", says Baumert. "But the more the negative factors accumulate, the higher the risk." So somebody with a tendency towards depression could be more affected by night shifts than a healthy person. Again: every suicide has more than one reason. For instance, another factor is how easy it would be to commit suicide. "Some professional groups are more at risk because they have access to methods of accomplishing this", says Thomas Bronisch. "Policemen carrying a gun, for example." As yet, the statistic does not provide any information regarding the exact correlations of increased risk. However, some logic deductions are possible. People are subjected to their working conditions for the larger part of the day. These therefore can impact on health. Specific working hours, such as shift work, also have an effect on people's private lives, because they impose a daily routine that is different to that of family and friends, Baumert explains. Night shift workers might develop insomnia, which in turn is a proven factor for increasing the suicide risk, says Baumert. "Shift work could lead to depression and that could lead to suicide – but that is speculation", says Bronisch. What does this mean for suicide prevention? Compared to alcohol consumption and depression, the factors investigated by Jens Baumert and his colleagues are easier to control – and not by those affected by them. "I hope that the study triggers a discussion", says Baumert. Employers should improve their working conditions: "Especially with regards to overtime", says Baumert. He is convinced: "Change is possible in most jobs." Thomas Bronisch does not believe that radically changing the economy is possible, yet he advises increased awareness for employees' needs: "Society is quite capable of making a difference. If more care is extended to employees, that could affect suicide rates", he says. The authors express a great hope in their study: employers could help to prevent suicides.